It’s wintertime, which means it's either already snowed in your neck of the woods, or you live in Miami and haven't seen the stuff in years. In areas of the country where it actually snows a lot -- or that even see an occasional dusting -- drivers generally turn to all-wheel drive as the ultimate solution for situations with minimal traction. That’s not entirely wrong: Being able to apply power with all four wheels often makes it easier to get out of sticky situations. All-wheel drive is not the cure-all that marketers would have you believe, though. When the surface of the road is too cold for your tires to grip much of anything, it’s time for a more effective solution: winter tires. Your tires are the number one factor in your grip levels, no matter what the weather is, but none more so than in the winter. Case in point: The correct rubber is so important to safety, winter tires are mandatory in Quebec between December and March. To prove the point, I drove two cars last winter that you'd normally be wary of taking out in slick conditions -- a zippy sports car and a terrifyingly fast Tesla with Ludicrous Mode. With winter tires? Piece of cake. Of all the tire categories out there, so-called "all season" tires are consistent across the widest swath of weather conditions, so tire manufacturers label them as "all season" to sell drivers on their ease of use. 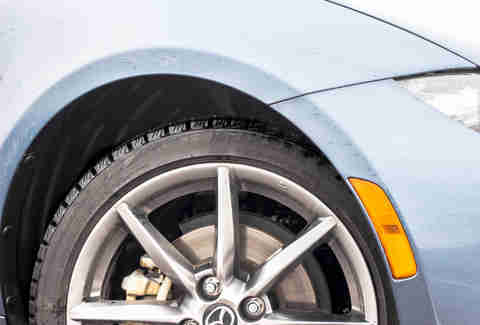 But compared to tires that specialize in things like traction, quietness, plush rides, and even rolling resistance, all season tires are hardly market leaders. Most consumers don't know any better than to take the tire manufacturer's word for it. Don’t. As our editor learned on a visit to winter tire specialist Nokian’s "White Hell" winter testing facility in Finland, the proper tires are essential for driving on snow and ice. As temperatures drop to around 45 degrees and beyond, most all-season tires turn to rubber pucks as their compound hardens up. Their level of grip drops dramatically, reducing their ability to send power to the road, turn, and stop in an emergency. To the untrained driver, driving in conditions too cold for your tires can seem even more slippery than driving in a summertime rainstorm. Believe it or not, under that pile of snow is a brick red Mazda3 rolling on all season tires. 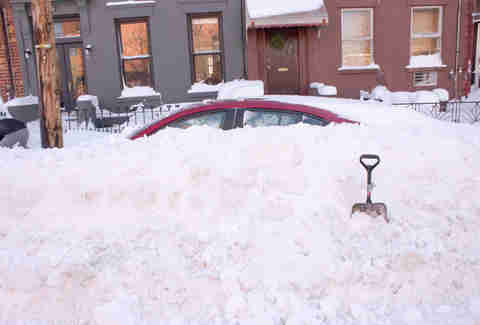 Last year, snow fell from the sky with no mercy, blanketing New York City for days. 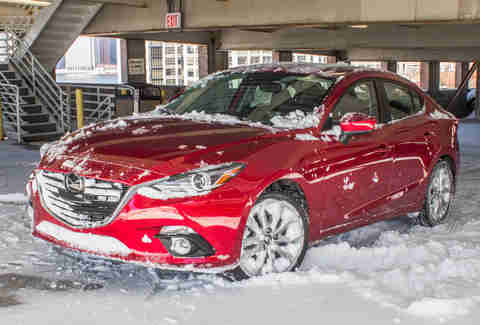 Once I shoveled it out, the front-wheel-drive Mazda had difficulty skating around Brooklyn, due to tires that simply weren't up to the task. Not only was the temperature too cold, but the tread itself was designed more for moving water during spring showers than sinking its teeth into wintry snow. At one point I drove it to a parking garage with a partial roof, meaning that there was snow inside the garage. It was a dicey situation to say the least, but the Mazda3 made it up the ramps... eventually. Driving would have been infinitely easier in the packed stuff with proper tires. As slick as it was, AWD would have been of only minimal benefit here. Unlike all season tires, winter tires are made of a different compound that's designed to work when the temperature drops. Don’t call them "snow tires," however, just because you swap them out at the first anxious thought of white powder falling from the sky; you definitely don't want to run them all year. Winter tires are great because they prioritize cold-weather grip over fair-weather performance, but if you try using them in the summer, you'll not only suffer the consequences of degraded ride and sound qualities, but their longevity will be reduced by an order of magnitude. 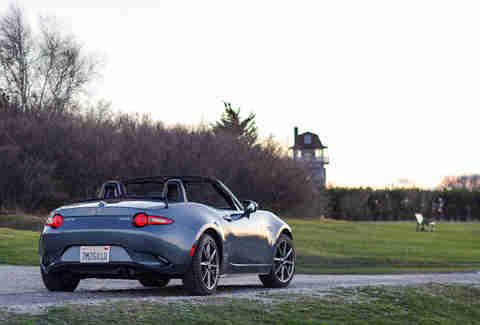 That same winter, Mazda lent me an MX-5 Miata to play with, er, test. If you think I’d scoff at the chance to drive one of the best cars of 2015, despite the expected below-freezing temps, you’d be wrong. I leapt at the opportunity, which was made all the sweeter because the rear wheel drive Miata was fitted with Bridgestone Blizzak winter tires. Over a 500-mile, top-down (yes, I'm certifiable) drive from New York to Cape Cod and back, it was sunny, it snowed, and it was extraordinarily cold. The Blizzaks were a little noisy on the road, due to the different tire compound, but the rear wheel drive Miata never flinched. The best benefit of winter tires? They make things like Tesla's "Ludicrous Mode" even more ludicrous. Can you even drive an electric car through the snow? You can, and you should. 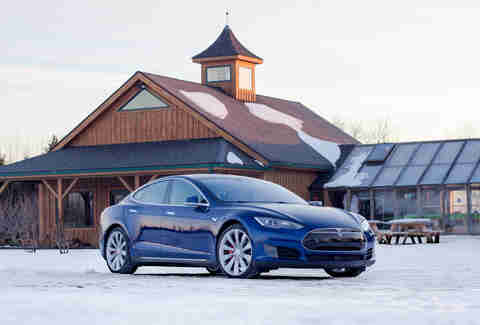 When the temperature once again fluctuated between freezing and 0ºF, I borrowed a Tesla Model S P90D, complete with its Ludicrous Mode and Autopilot self-driving technology, for another road trip. That should be the death knell for any car with more power than any mortal should be allowed to handle, but the all wheel drive P90D hoofed through the snow with aplomb on its Pirelli Sottozero tires. It was something of a masterclass in road tripping, what with ultra-steady grip, even as it snowed buckets on I-95 in the dark. Power was temporarily reduced because of the low temperatures, but only under hard acceleration -- something that shouldn't have even been possible in those conditions without losing control. Perhaps unsurprisingly, the only downside to driving a powerful and semi-autonomous Tesla through a snowstorm is that many of the sensors required for Autopilot froze and were temporarily unavailable -- at a moment when you really wish your self-driving car would take care of the hard part of driving. Unless, of course, you've got the right tires. Even though they take up space in the garage for eight months out of the year and you have to remember to install them, winter tires are a very serious boon in real-world driving. No matter what car you drive, and no matter if it's all, rear, or front wheel drive, once you use them, you'll never go back. It's like finally being clued in to a trade secret. They'll not only make winter driving easier, they could potentially save your life. Jeff Jablansky is a contributor to Thrillist Cars, and once got royally stuck in an i3 during a winter storm thanks to incorrect tires. If you skate over to Twitter, you can find him @unclewithcars.